Religion – One of the most painful things to see in life or in relationships or in business is a person trying really hard to be what they are not, or sweating to produce what they cannot. It is the essence of religion to put on a happy face and pretend to be something that we are not. Religious obedience is the ultimate stress and anxiety in our hearts. Ironically, there are times when we have all tried and failed in such vain attempts at pretense. Rest – By contrast, there is another place in the Spirit, in relationships and in work, called rest. We see this in the lives of a few. There are those who are at peace with themselves, who produce great and graceful results in a very natural way without trying very hard. We say, “It came naturally to them.” Fame and fortune and love seem to follow them, and they are always leaders just by the fact that the rest of us would love to be like them. God himself admires them, and even His suggestion is that we should “make every effort” to enter that rest. How do I get there? – Our ability to enter that rest is heavily influenced by our model of life and how we interpret it. There are four influences on our lives that must be balanced to maintain our equilibrium in anchored reality. Let’s look at the consequences of taking any one of these to an extreme. The Law of Attraction has roots in Buddhist Karma, a law of nature suggesting that you will be rewarded for good moral actions and punished for bad ones by an impersonal cosmic force. If we interpret life through the narrow lens of Karma, we are prone to ignore the reality of God’s favor, natural circumstances and spiritual warfare. We’ll also blame ourselves and others for everything that goes wrong or doesn’t go right. Karma is a ticket to condemnation… an endless treadmill of self-improvement and works that rob our peace and rest. In proper balance, personal responsibility and initiative are a key ingredient of living life to the fullest. The sum of what we believe and do is simply not a complete explanation for everything that happens… they are important, but incomplete. We must get outside the limitations of our own strength and wisdom to be joyful. 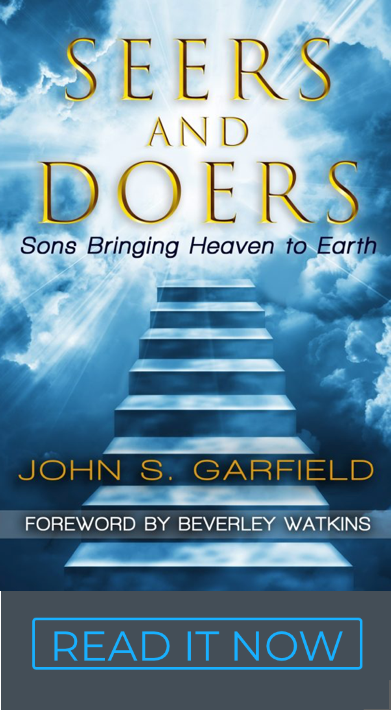 God’s favor – Some depend on God to do everything, and get mad at Him when He doesn’t deliver. Others live their lives as though His presence and miraculous intervention is a thing of the past or never existed in the first place. The reality is that God does intervene in our lives. He does answer prayer. He does do miracles, even through us. One of the great keys to maintaining our rest and peace is working with the Father and feeling the wind of His spirit in our sails to build His Kingdom and bless nations in every mountain. Even when my mind has no answers, there is a place of peace and rest in trusting Jesus, understanding His plan and working with Him instead of just on my own. The key is finding the balance between my initiative and God’s intervention. We both do everything we can to build the Kingdom! Natural circumstances – Some separate their spiritual life from work and natural events, and attribute everything that happens to bad luck and happenstance. Others believe that every earthquake is the judgment of God falling on sinful societies. The fact is that some things just happen and it’s no one’s fault… and it’s not God’s judgment. It’s also true that we can speak to the storm and calm the seas when the need arises. Spiritual Warfare – The reality of Satan, demons and evil are seldom acknowledged in our modern culture. Even believers often fail to connect the dots behind enemy strategies and events. There are spiritual forces behind cultural ideologies that influence groups of people. It is still possible for an individual to suffer from a range of demonic oppression all the way to possession. Interpreting life without this awareness is like going to battle without a shield and a gun. We do have power over Satanic and demonic influences. 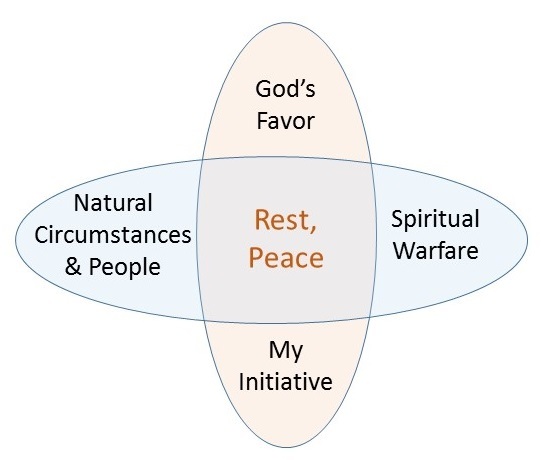 Interpreting everything through the lens of spiritual warfare can be equally imbalanced. The goal – Rest and peace come from finding the desire of our hearts and moving toward those life goals and dreams. Rest and peace don’t really describe the end state. The Kingdom is a party filled with joy and rejoicing and worship and dancing. The bottom line is that it’s fun to find and fulfill the desires of your own heart and find out that that God has the same desires in His heart. We do connect with our hearts and become whole. We do live in the moment and find our way through difficult times. It all happens when we live in Him and touch His heart. Jesus doesn’t just live in my heart. I live in His as well. Being connected with my own heart and with the heart of Jesus releases a dimension of fruit and power and rest and fun that blesses nations. Pretty amazing!